Artificial Intelligence, robotics and big data are revolutionising the way we live and work. Euronews reporter Paul Hackett travelled to Stockholm to investigate the opportunities for business. He met Dr Daniel Gillblad, a senior researcher and director of the Decisions, Networks and Analytics laboratory at RISE SICS. So what about the growth potential of these technologies? “It’s really, really enormous," Dr Gillblad said. Stockholm-based Furhat Robotics has developed a computer interface that can interact with people. The technology is already being piloted in the form of a multi-lingual concierge at Frankfurt airport to help passengers find their flights and get around. "A teaser of how this world could look in the future"
However the robot’s designers have bigger plans. Furhat’s human like qualities could see it used in education and healthcare. “The industry potential is huge and there really is no big player yet," explained Samer Al Moubayed, CEO and co-founder of Furhat Robotics. "We see robots in everybody’s house. This specific Furhat, of course, is a specific form factor. "It’s a head but it’s a very good teaser into what the technology we’re building could deliver - that user experience, that engagement with people. So we imagine robots to be everywhere. Of course, the hardware we’re building, the way the robot looks, is going to evolve. It’s going to change. We might have different robots that look in different ways. It might go into other types of platforms, like virtual reality. You know, meeting characters that you can talk to, in holograms. But as long as we build a very powerful interaction experience, user experience, we can take that into very different form factors." In short, Al Moubayed explained: "This is just a teaser of how this world could look in the future. Day one of the long journey." The European Union has just unveiled a new plan to boost investment in AI. The measures also seek to create the right environment to ensure trust in the technology. Leaving to one side the potential impact on jobs, we asked Dr Gillblad how innovations of this sort can drive a company forward, from a purely business perspective. “It can automate a lot of production and supply chain management, helping you run your business more efficiently," he explained. "Most importantly, try to get a good understanding of what can and cannot be done with this technology today," Dr Gillblad advised. • Emerging technologies, such as artificial intelligence (AI), robotics and big data, are transforming the way we live and work. • AI has the potential to provide solutions to major challenges, such as treating chronic diseases or anticipating cybersecurity threats, which creates new opportunities for innovative businesses. • But these opportunities are not being seized: only 25% of large enterprises and 10% of SMEs in the EU used big data analytics in 2017 and only one in five enterprises was highly digitised. • One company has made the leap of faith – a Swedish start-up Furhat has developed a novel computer-to-human interface that is based on years of research and development on social artificial intelligence. 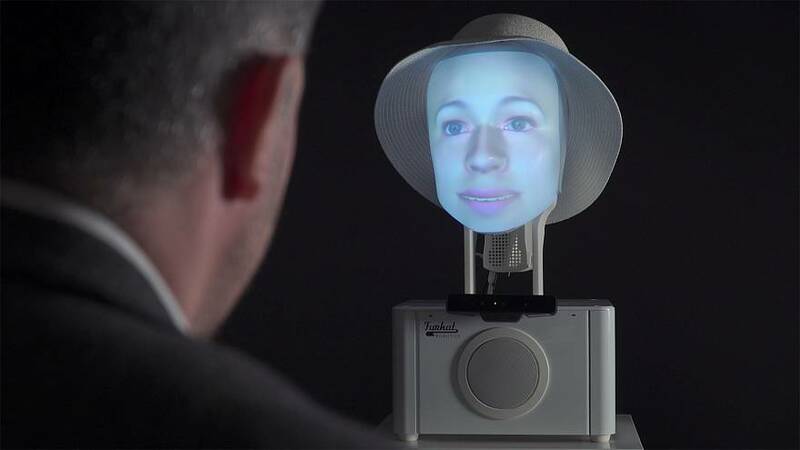 • This social robot can be used in learning, therapy or healthcare and has won the company many top scientific awards, including the Christian Benoit Award, and the ICMI Outstanding Demo Award. • To help people and businesses make the most of AI, in April 2018 [25 April] the EU put forward its plan to boost investment in AI, make more public data available, support the development of digital skills and ensure that an appropriate ethical and legal framework is in place.